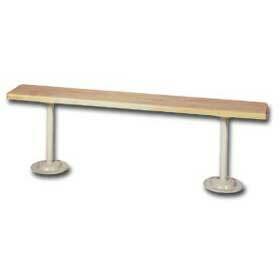 Shop for high quality locker benches at Material Handling Solutions. 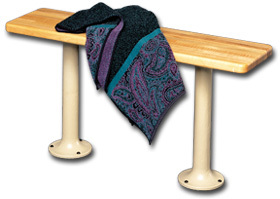 Our durable locker benches are ideal for use in schools, locker rooms, gymnasiums, athletic clubs, spaâ€™s and sports clubs. Our attractive laminated hardwood locker benches can be ordered in various lengths. Pedestals can be ordered separately and are constructed of heavy-duty steel for strength and stability. 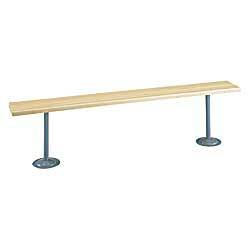 We also carry high density polyethylene plastic locker benches. These locker benches wonâ€™t bend, rust or dent and they withstand impacts that normally would damage other types of benches. Send us your drawing and one of our CAD specialists will layout your lockers absolutely free. 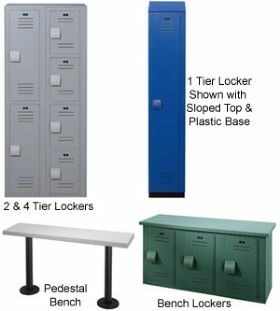 Customers who purchased locker benches also bought lockers, linen carts and janitorial carts. We offer many other types of material handling equipment. Please check our large selection of storage cabinets and industrial mats to improve the look of your facility. We can customize any mat or runner with your own personal logo. Call us toll free and we will design your mat for you.